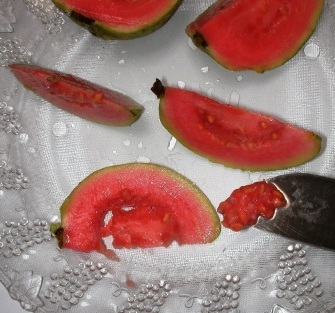 Usually to make guava juice, the inner meat is removed as it contains seeds. But since the inner meat has a distinctive and delicious taste, it is too valuable to be wasted. The volume of inner meat can reach about 35% of total meat. 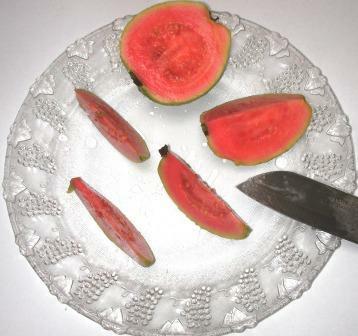 Some species of Guava have fewer seeds, such as red guava and crystal guava. To separate seeds from the juice, it can be done by filtering. But to be filtered, the juice should be added with a lot of water to make it thin enough to pass through the filter. But too much water will reduce the flavor and taste and the juice becomes flat. Another way to separate seeds from the inner meat is by slicing guava and separate seeds with a knife. Cut half a guava lengthwise, from the base of the fruit to the end of the fruit. 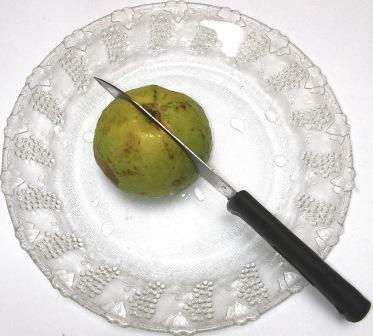 Cut lengthwise again until quite thin, typically 1 guava is thin enough when cut into 1/8 - 1/16 section. The thinner the easier it will be to discard seeds. Separate the seeds from the inner meat with a knife, be careful not to waste too much inner meat. 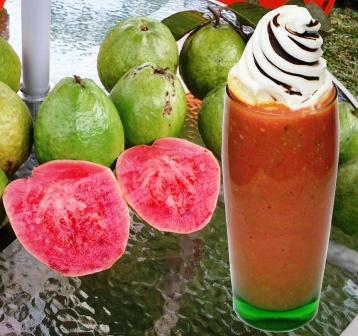 Put sliced and cleaned guava into the blender. 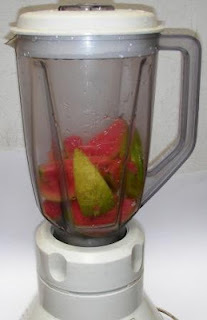 Add a little water so the blender can grind guava smoothly, ¼ cup of water is usually enough. Too much water will make the juice taste flat. As shown in the very top photo I add ice cream float (vanilla chocolate) for complement. You can also add honey as a sweetener. Honey is no problem for diabetics. Honey sweetness comes from fructose, which if it enters the body can be directly processed into energy without the need for insulin to help the process. As we know that people with diabetes because the body lacks insulin of hormone. Guava contains high vitamin C, four times higher than oranges. Many traditional medicines are having guava ingredient. Healt benefits of guava include: help to cure dengue, treating diarrhea, constipation, diabetic, high blood pressure, and others. Hope you enjoy the benefits of this guava juice.